Laying a table a job I love; every task tinged with the anticipation that the table will soon be filled with friends and family. There is something so magical about leading people into a room with a set table, candles and music. With a mood set you can serve simple food but everything will feel a bit more considered. I have a bit of an obsession with tableware; from glasses to napkins, jugs to platters, every nook of my kitchen is filled. When laying a table think about using different heights. Glassware, candles and flowers will all add to the rise and fall. Use one colour or fabric as a guide and then build everything around that. Most of all though, make it casual and achievable; use what you have for everyday with a few added touches. Sometimes the bare wood of a table is all you need but often a tablecloth or a linen runner is where I start, then you can layer up fabrics creating amazing texture. 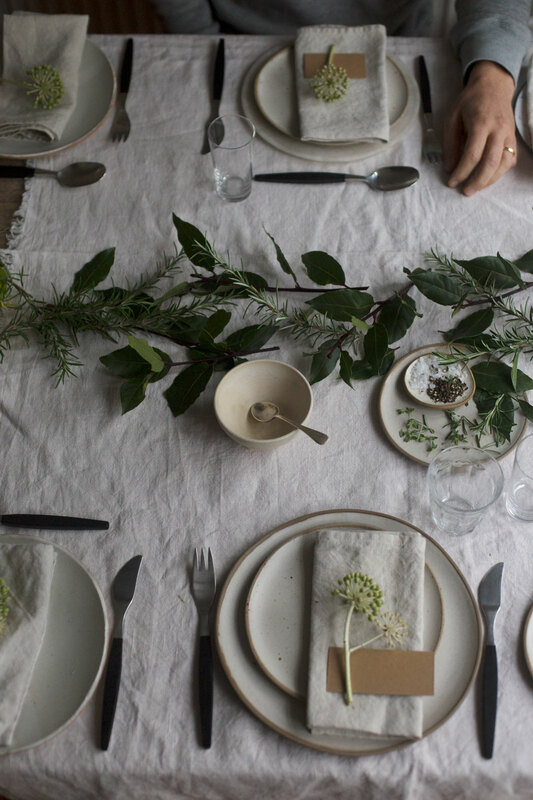 You can buy linen tablecloths now pretty affordably from most homeware shops, or buy a couple of metres off the roll from a haberdashery. I like to wash mine and hang it on the washing line so it has a crumpled texture and isn’t too neat. Brown paper is a good substitute if linen feels too much. You can cut place mats from fabric too; the frayed edges look nice. Muted base tones work well for lots of different occasions, then you can use other things to create accents. Use the season’s plants and blooms as decoration. Herbs are amazing; they will make the table smell good too. I put my herbs or flowers in little bottles, jars and modern stem vases, usually only one or two stems in each vase and playing with height. Here are some ideas of what to use throughout the year. 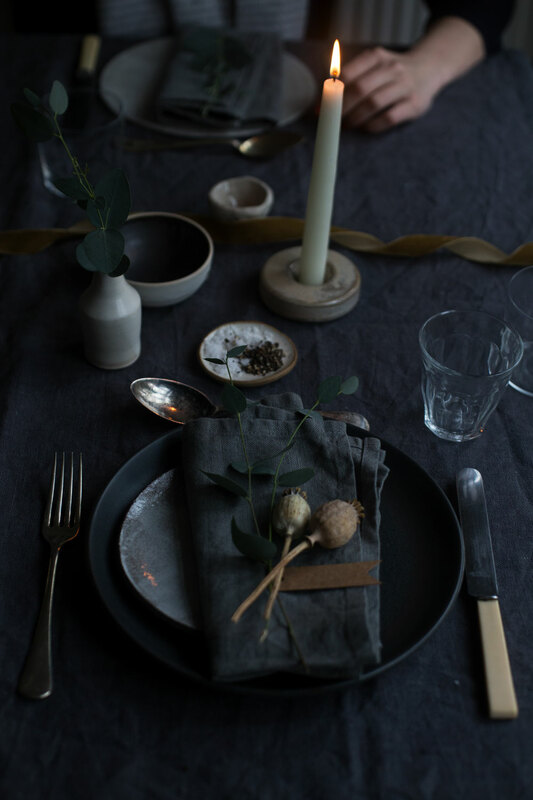 Winter: bay leaves, rosemary, snowdrops, winter berries and twigs, little bags of home- made truffles. Eucalyptus looks great laid down the middle of the table. Spring: bunches of primroses, narcissi, painted Easter eggs, chocolate eggs, hyacinths. Summer: sweet peas, roses, lemons, bunches of aromatic mint, lavender, cherries, lemons. Autumn: imperfect squashes, rosehips in little jugs, autumn leaves, skeleton leaves, seed heads, dainty pine cones. Menus are nice mementos for people to take away; I have a shoebox of menus that I love to look at. They can be written on simple card or paper in your best handwriting. 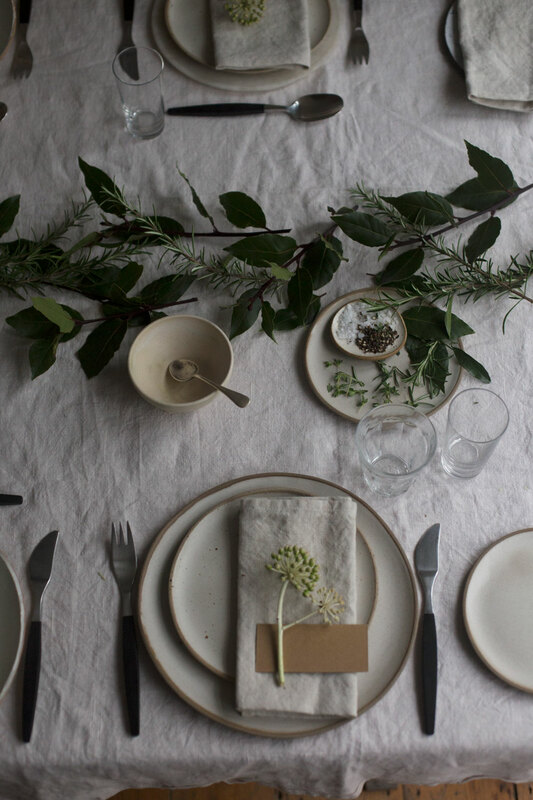 Place settings are a good idea if you want to choreograph who sits where, written simply on cards or even on little pebbles with a chalk pen or marker. If it’s a really special dinner you could think about a table present to take away: home- made teas, little meringues, essential oil blends, homemade truffles, small bottles of sloe gin or cordial. I did this at my wedding but haven’t done it since, so I’m talking really special meals here. I like to keep drinks on the table or near to it if they’re in small ice buckets and jugs. That way you don’t have to top everyone’s drink up all night. I always keep a couple of jugs of flavoured water on hand: blackberry and sage; cucumber and mint; bergamot or lemon; rosemary and thyme. I use a mixture of different glasses: Duralex, fine glass tumblers and Champagne saucers. Charity shops and car boot sales are amazing places to pick up old glassware. Linen napkins are easy to find and quite reasonable but if not then use fabric offcuts. If they have a bold pattern fold them inside out, or use squares of soft denim or simple white cloth. Tie velvet ribbon, brown string or brightly coloured twine around them; you can also lay leaves, herbs or even pressed flowers on top, securing them with a nice paper clip or even some bright washi tape. Lights are so important. I go for candles: sometimes just one, other times a mixture. Church candles, classic tapered beeswax ones, tea lights in glasses are all cheap. I love to use dark candles in grey, navy and black. For something more special, festoon lights, fairy lights or even paper lanterns hanging from the ceiling would all look amazing too. table is a tapestry of everything I love, I almost always put all the food in the middle rather than serving it plated; I love the interaction, the hand crossing and passing around. Shop around for interesting things from antiques and vintage fairs (see page 424). Colour and fun are key here. I make my kids’ tables every colour of the rainbow with party hats, pom poms, coloured napkins. Once I even made biscuits with names on – admittedly that was going a bit far.